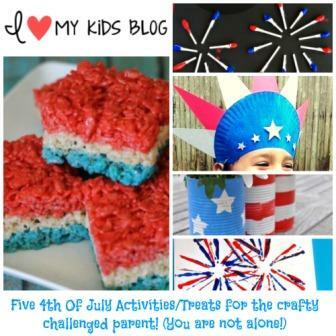 Five 4th Of July Activities/Treats for the crafty challenged parent! 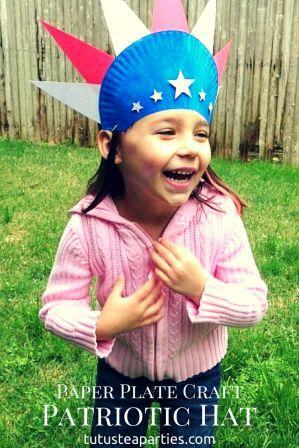 If you are anything like me, you want to do something fun with your kids to celebrate the 4th of July. It is a very special day and I want to instill understanding in my young kids just how important our freedom is! 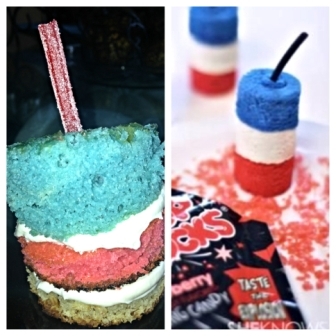 I jumped on good ol’ Pinterest and found tons of cute things to do, like these firecracker cakes…they have pop rock candy in them and are made out of 3 layers….Adorable, right? Would this happen to you too? I am slightly crafty challenged. Awesome job to all you people out there that would be talented enough to pull this off. 😉 I began searching for crafts/snacks that even a crafty challenged person like myself could pull of and I found these 5 activities/snacks that will actually turn out! I wish you much luck and hopefully we can all stay off those “Pinterest Fail” sites with these projects! It is hard to mess this one up, cut various lengths of Q-tips for your kiddos. Give them each a small bit of red and blue paint on a paper plate. Show them how to dip just the tip of it. Set them aside to dry. 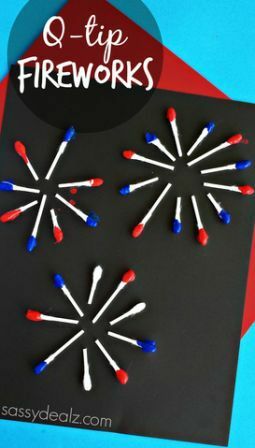 Once dry, allow them to create their own fireworks (also provide them with clean not painted cut Q-tips for the white! They can make regular fireworks or get creative and spell out their names or a shape/design! Don’t toss those cans after you’ve emptied them. Wash them out, set them aside, and in a couple of days you can paint some fun flower vases with your children. My kids LOVE to paint. Craft paint is pretty cheap making this a inexpensive craft to do with the kids! Don’t need flower holders? Maybe you can put a few rocks in the bottom and stick small flags in them to display around your house. Either way, the kids will be entertained while painting for a good part of the day! 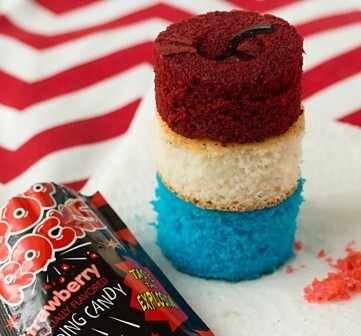 #3 Fourth of July Rice Krispy Treats! After 2 crafts, I think we need a snack! Take a deep breath, this looks fancy, but even I can pull this one off! Full instructions and photo credit are HERE. Just do one step at a time using 2 cups of marshmallows, 2 cups of rice krispies, and a TBS of butter per layer. Add more or less food coloring to get the colors you desire! 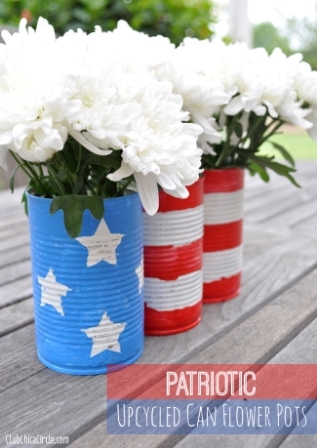 I just think these firework crafts are so cute and do-able! Using 7 straws extend the “necks” out and tape the long part of the straws together. 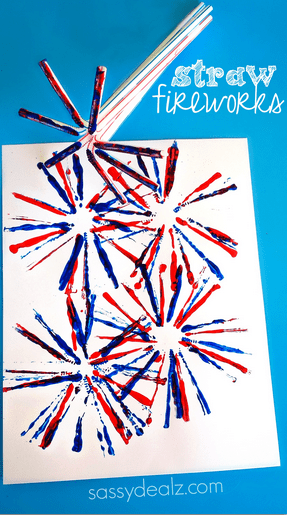 Dip in paint and TADA another cute firework craft! I have all girls and this craft would delight them beyond belief! To simplify it for them, I’d let them color their half plates while I cut the triangles & stars out. Although this blogger has some great instructions on how her’s turned out so cute-Go HERE to see! My kids would love to wear one of these to the 4th of July Parade! My fellow crafty challenged friends, I hope this post has helped and that you have a blast with your children celebrating this year! Happy 4th of July! 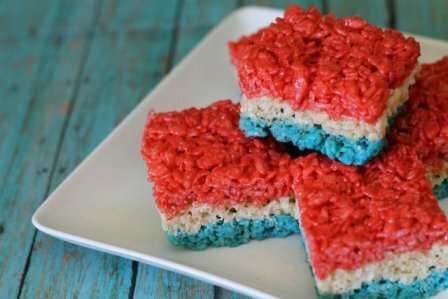 I really love those red, white and blue rice krispy treats. So cute! Q-tips and paint….I can handle that! Anything beyond, not sure.